Barberry (Berberis vulgaris) is a bush native to Europe, Asia, the Middle East, and North Africa that's been naturalized to many regions of North America. The berries of the barberry are traditionally used to make jams and jellies. But the herb also has a long history as a folk remedy for digestive disorders, including constipation, diarrhea, dyspepsia, heartburn, and loss of appetite. It was thought to increase the flow bile, which is why it was used for liver and gallbladder problems. Topically it was recommended to treat skin conditions like eczema, psoriasis, and acne, as well as minor wounds. The active constituents in barberry are thought to be the isoquinoline alkaloids, particularly berberine. Alkaloids are a class of naturally occurring organic nitrogen-containing bases; other well-known alkaloids include morphine, strychnine, quinine, ephedrine, and nicotine. The alkaloids in barberry are found in the root, rhizome, and stem bark of the plant. Other herbs that contain berberine are goldenseal (which has a higher concentration of berberine than barberry), the Chinese herb Coptis, and Oregon grape. Though there are studies of berberine that may apply to barberry, evidence for any health benefits for barberry is extremely weak. Any benefit likely relies on the fact that it contains berberine, for which medical uses are being established. For instance, scientists have investigated berberine's traditional use in fighting infections. According to a 2008 review article on natural approaches to preventing and treating infections of the lower urinary tract, berberine extracts demonstrate significant antimicrobial activity against a variety of organisms, including bacteria like Chlamydia, viruses, fungi, and protozoans. The Chinese have used berberine-containing herbal remedies for more than 3,000 years, and berberine is an over-the-counter drug in that country for the treatment of gastrointestinal infections, such as bacterial diarrhea. In 1988, the hypoglycemic effect of berberine was discovered when berberine was used to treat diarrhea in diabetic patients in China. Research shows that applying a gel containing berberine can reduce pain, redness, oozing, and the size of ulcers in people with canker sores. Berberine seems to slightly reduce blood sugar levels in people with diabetes. The results of one pilot study on 84 patients published in 2008 suggest that taking 500 mg of berberine two to three times a day for up to three months might control blood sugar as effectively as metformin, a first-line drug for type 2 diabetes. In addition, berberine showed a favorable influence on cholesterol, unlike metformin, which has barely any effect. As the authors of a review article from 2015 noted, "with little documentation of adverse effects, berberine is positioned as a potential candidate drug to treat type 2 diabetes." There is early evidence that berberine can help lower cholesterol levels in people with high cholesterol. Taking 500 mg of berberine twice a day for three months seems to reduce total cholesterol, LDL or “bad” cholesterol, and triglyceride levels in people with high cholesterol. In another clinical trial, 63 patients with high cholesterol were randomly divided into three groups. The first group was treated with berberine (1,000 milligrams a day), the second with the prescription drug simvastatin (20 milligrams a day), and the third with a combination of berberine and simvastatin. The authors reported a 24 percent reduction in LDL levels in those treated with berberine, a 14 percent reduction in those treated with simvastatin, and a 32 percent reduction in the group treated with both simvastatin and berberine. Taking 0.9 grams of berberine a day along with the blood pressure-lowering drug amlodipine reduces systolic blood pressure (the top number) and diastolic blood pressure (the bottom number) better than taking amlodipine alone in people with high blood pressure. Research suggests that berberine can lower blood sugar, improve cholesterol and triglyceride levels, reduce testosterone levels, and lower waist-to-hip ratio in women with PCOS, a hormonal disorder common among women of reproductive age. In some women with PCOS, the drug metformin is prescribed to prevent diabetes from developing (women with PCOS have been shown to have higher levels of insulin when compared to women of the same weight without the condition). Some research shows that berberine can lower blood sugar levels similar to metformin, but berberine seems to improve cholesterol levels better than the drug. Berberine may also improve fertility. In a pilot study, 98 anovulatory women with PCOS were given berberine (anovulatory bleeding is a type of abnormal uterine bleeding). Ovulation improved by an average of 25 percent after four months of taking berberine. Another study published in Clinical Endocrinology showed that women with PCOS who were randomly selected to take berberine had greater pregnancy rates than metformin or placebo and with fewer side effects when taken 12 weeks prior to IVF treatment. One of the most well-known uses for barberry was as an herb for treating diarrhea and dysentery, and research for this purpose go back at least as far as the middle of the 20th century. In one study published in the Journal of Infectious Diseases, people with diarrhea caused by E. coli who took a single dose of 400 milligrams of berberine experienced a 48 percent decrease in stool volume during the eight hours following treatment compared to the placebo group. The berberine group was also significantly more likely to stop having diarrhea within 24 hours of treatment. However, according to NMCD, there's insufficient evidence to rate the effectiveness of berberine for diarrhea. Barberry enthusiasts recommend introducing yourself to the berries by having them in sauce, jelly, juice, wine, or tea. You can also try substituting some barberries for raisins or cranberries when baking (barberries taste more sour). Barberries (also called zereshk) can be purchased at Mediterranean or Middle Eastern grocers, some health-food shops, or on the Internet. To maintain color and quality, be sure to refrigerate the berries. Barberry is available in tea, tincture, capsule, fluid extracts, dried herb, and tablet forms, as well as a topical ointment. There is no established daily dosage for barberry: Recommendations range from two grams to six grams of the berries or an equivalent amount in extract form. Barberry extracts are standardized to contain eight to 12 percent alkaloids, of which berberine is the most prevalent. However, it's not clear that barberry provides enough berberine to produce any purported potential benefits. In large doses, barberry may cause vomiting, diarrhea, convulsions, and dangerous drops in blood pressure, heart rate, and breathing. Do not take barberry without discussing it first with your physician especially if you take anticoagulants (blood thinners), blood pressure medication, diabetes medication, diuretics (water pills), antibiotics, and antihistamines. Barberry may decrease or increase the effectiveness of these and other drugs. For example, one study published in the European Journal of Pharmacology found that berberine elevated the amount of the drug cyclosporin A in kidney transplant patients. An overdose of barberry can result in kidney irritation. Symptoms of kidney problems are bloody urine, pain when urinating, low back or stomach pain, and fever. Seek medical attention immediately. Barberry should not be used to replace conventional treatment. In particular, it shouldn't be used as a home remedy for UTIs. If the bacteria aren't fully eradicated, the infection may spread to the kidneys, even though symptoms, such as difficult or painful urination, may disappear. Pregnant women should not use barberry because it may stimulate uterine contractions and cause miscarriage. The safety of barberry in nursing women and children is unknown and should be avoided. Keep in mind that supplements haven't been tested for safety and dietary supplements are largely unregulated. In some cases, the product may deliver doses that differ from the specified amount for each herb. In other cases, the product may be contaminated with other substances, such as metals. Also, the safety of supplements in those with medical conditions or who are taking medications has not been established. When buying supplements, look for products that have been certified by ConsumerLabs, The U.S. Pharmacopeial Convention, or NSF International. These organizations don't guarantee a product is safe or effective, but they indicate that it's undergone testing for quality. Cernakova M, Kostalova D. Antimicrobial Activity of Berberine-a Constituent of Mahonia Aquifolium. Folia Microbiol (Praha) 2002;47(4):375-8. Duke, James A. The Green Pharmacy. Emmaus: Rodale, 1997. Feltrow, CW and JR Avila. The Complete Guide to Herbal Medicines. New York: Simon and Schuster, 2000. Head Kathleen A. Natural Approaches to Prevention and Treatment of Infections of the Lower Urinary Tract. Alternative Medicine Review Volume 13, Number 3 2008. Jun Yin, et al. Efficacy of Berberine in Patients with Type 2 Diabetes. Metabolism. 2008 May; 57(5): 712-717. Jun Yin, et al. Traditional Chinese Medicine in Treatment of Metabolic Syndrome. Endocr Metab Immune Disord Drug Targets. 2008 Jun; 8(2):99-111. Kong WJ, Wei J, Zuo ZY, Wang YM, Song DQ, You XF, et al. Combination of simvastatin with berberine improves the lipid-lowering efficacy. Metabolism., 2008; 57, 1029–1037. Lahiri SC, Dutta NK. Berberine and chloramphenicol in the treatment of cholera and severe diarrhoea. J Indian Med Assoc. 1967 Jan 1;48(1):1-11. Lin L, et al. A Single Arm Pilot Study of Effects of Berberine on the Menstrual Pattern, Ovulation Rate, Hormonal and Metabolic Profiles in Anovulatory Chinese Women with Polycystic Ovary Syndrome. PLoS One. 2015; 10(12): e0144072. Mohammed, Gina. Barberry: A Shrub with Medicine in Its Makeup. Mother Earth Living. 2008. Neag Maria A, et al. 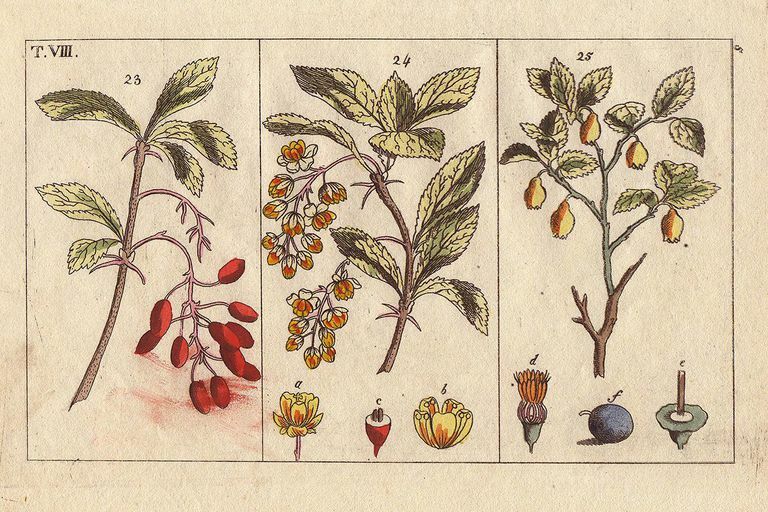 Berberine: Botanical Occurrence, Traditional Uses, Extraction Methods, and Relevance in Cardiovascular, Metabolic, Hepatic, and Renal Disorders. Front. Pharmacol., 21 August 2018. Peirce, Andrea. The American Pharmaceutical Association Practical Guide to Natural Medicines. New York: William Morrow, 1999. Rabbani GH, Butler T, Knight J, et al. Randomized controlled trial of berberine sulfate therapy for diarrhea due to enterotoxigenic Escherichia coli and Vibrio cholerae. J Infect Dis 1987;155:979-984. Wu X, Li Q, Xin H, Yu A, Zhong M. Effects of Berberine on the Blood Concentration of Cyclosporin A in Renal Transplanted Recipients: Clinical and Pharmacokinetic Study. Eur J Clin Pharmacol. 2005 Sep;61(8):567-72.